With my wife having returned to San Jose, I was on my own in the Las Vegas area for three days until she flew back on Thursday. With temps approaching 90F in town, I headed to the higher elevations in the Spring Mountains to give me cooler temps for sleeping, as well as for hiking the next few days. I ended up parked at 6,500ft near Wheeler Well, plenty chill for sleeping - too much, really, as it was 36F when I awoke in the morning. It was the first night sleeping in the Jeep, consumating our new relationship, so to speak, and it worked out well enough. I had to do more gymnastics than I was used to in the van - getting from the front to back of the Jeep without going outside takes some effort, and manuevering in the night for my periodic pee breaks was tough as well, but I slept as good as could be expected. My peaks for the day included a pair of P1Ks and a P300, all of them found in Purcell's Rambles & Scrambles. This was the hardest of the day's outings, about 2,000ft of gain and six miles roundtrip, which is why I chose to do it first. My approach was from the east near Wheeler Well, not far from where I had spent the night. I attempted to use a 4WD road shown on the topo to get me a little closer, but this was signed for No Vehicles and blocked with large boulders, just to be sure everyone gets the message. I parked at what appears to be a redneck-y campsite near the main road and would use the last quarter mile of the closed road to start up. The cross-country travel was through semi-open forest - no real bushwhacking, but lots of weaving around trees, all the way to the summit. As Purcell describes in his guidebook, the higher south summit is mostly covered in trees with poor views. I found a lightly-used register left by John Vitz in 2009 and added my entry at the bottom of the second page. I paid a visit to the north summit as well, a more aesthetic point with some easy class 2-3 scrambling and open views in all directions. 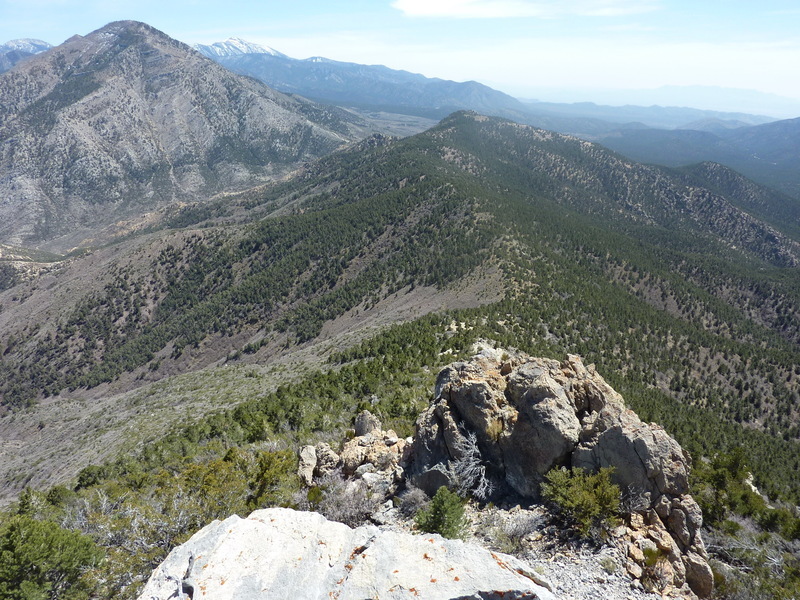 Haze obscured views to Pahrump to the southwest, but views east and west along the Spring Mtns were nice. Dropping east off the north summit, I followed an alternate return route, though not appreciably better or worse than the ascent route. Back before 9:30a, the outing had taken just under 3.5hrs. Purcell describes a route coming from Wheeler Pass, but acknowledges it's probably easier from Wheeler Well, and so it is. There is a road that climbs up to a prospect near the saddle on the northeast side of the peak, less than 1/3mi from the summit. Unfortunately, this 1.5mi spur road is now closed as part of a Wilderness study area. Still, it can be hiked to make it fairly easy to approach the peak. More forest meandering from the saddle gets one to the upper rocky summit area in short order. There is some fine class 3 scrambling to be had, albeit somewhat short. There are two closely-spaced summit rocks of nearly equal height. I visited both in traversing the summit east to west before circling back to the east side to descend. An hour and a half sufficed for the effort, less than 1,000ft of gain and 4mi roundtrip. I probably could have saved a good deal of time by climbing Wheeler BM in conjunction with Mine Peak, but that would have negated the need to drive to Wheeler Pass. Normally I would have been happy to forgo the extra driving, but with the Jeep it was really great fun. The road has some pretty rough areas that would have challenged most vehicles, but the Jeep made it seem like play. Hugely fun play, too. Wheeler BM lies about 2.5mi northwest of Wheeler Pass, all cross-country save for a short bit of road/trail just above the pass. The route follows a long ridgeline rising to the peak, with steep portions at the beginning and end, a more gentle stretch in the middle, covering 3/4 of the route. The only real scrambling is contrived and avoidable, with lots of steep, limestone talus for the final climb. The highpoint is found to the right of where one gains the crest, an easy, welcomed finish. Willow Peak looms higher across Wheeler Pass as do the other high summits of the Spring Mtns. To the west, the peaks fade off in the distance, Wheeler standing as the highest one west of the pass. There was the expected benchmark and a rather busy register, a MacLeod/Lilley special from 1986 with 35 pages of entries. It gets far more attention than Spring Peak, the other P1K, probably because it is quite a bit higher and very prominent on the crest from both sides of the range. A little over 3hrs for the five miles and 1,800ft of gain.